Dr. Ghassem Asrar of Pacific Northwest National Laboratory was quoted in an Eos article after the close of the American Geophysical Union's 2016 Fall Meeting. The article, "Scientists Ponder the Way Forward Under Incoming Administration," questioned several attendees at the meeting to sample reactions to the recent U.S. national election. Asrar believes in using science to serve humankind. "Earth observations provide societal and economic benefits, for example, for agriculture, fishing, and shipping. It's [about] how we can take advantage of science and technology to serve us and the rest of the world," he said. 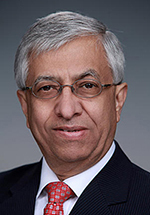 Asrar is the director of the Joint Global Change Research Institute located in College Park, MD, an organization jointly sponsored by PNNL and the University of Maryland. His research focuses on understanding earth science using remote-sensor capabilities, including Earth-orbiting satellites, to provide fundamental insights into the connections between Earth's land, oceans, atmosphere, ice, and life. In previous positions, he has served as Director of the World Climate Research Program, the Agricultural Research Service, the U.S. Department of Agriculture, and the U.S. National Aeronautics and Space Administration. With advanced degrees in soil biophysics, civil engineering and environmental physics from Michigan State University, Asrar commands a broad understanding of Earth and climate change topics.